La roca fria del calvari. Zarzuela. Serrano: La Dolorosa. Operalia 2008, Canada. Excerpts from Joel's recital at Wigmore Hall, selected arias from Donizetti's "Il Duca d'Alba" and "L'elisir d'amore"
– The Puerto-Rican / Spanish tenor will open the season at the Semperoper this October in Les Troyens, before returning to Madrid, Puerto Rico and Santiago de Chile. After a season during which he accumulated triumphs and debuts in Europe, America and Asia with engagements in Toulouse, Warsaw, Tokyo, Los Angeles Dresden, Moscow and Beijing, Joel Prieto will begin the new season in October by taking on the role of Iopas once again in the Berlioz opera Les Troyens. 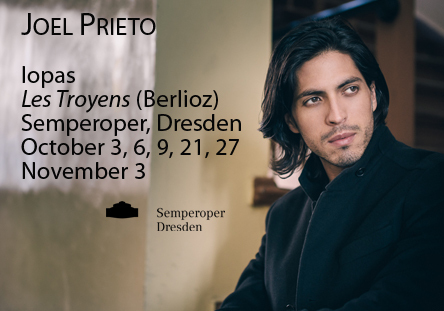 Prieto has already sung in this opera at the Deutsche Oper Berlin and this time will be performing it at the Semperoper in Dresden on the 3rd, 6th, 9th, 21st and 27th October and the 3rd November. With a vibrant score which is musically explosive, this great opera is based on Virgil’s Aeneid and is only very rarely performed due to its complexity. It tells an epic story of war and peace, true to the spirit of French Romanticism, and between the choir and the soloists gathers together more than 120 singers on stage. The performances in Dresden will be conducted by Lothar Koenigs in a new production directed by Lydia Steier. For Joel Prieto the last season “was dizzying. Throughout the season my beloved Mozart accompanied me in debuts full of emotion in which I trod the boards at some of the most emblematic theatres where I have always dreamed of singing, such as the Grand Theatre in Warsaw, Los Angeles Opera, the Bolshoi Theatre in Moscow and the Tianqiao Performing Arts Center in Beijing, as well as having the opportunity to perform Mozart’s Ninth Symphony alongside the Tokyo NHK Symphony Orchestra, no less,” the tenor explains. “I am immensely looking forward to throwing myself into new repertoire over the next few months, which I am sure will bring me marvellous experiences,” he adds. After this opening in Germany Joel Prieto will be returning to many other venues including the Teatro Real in Madrid – the city of his birth – a theatre where he made his debut two years ago in The Magic Flute and where he will be returning with one of the most talked about events in the Spanish cultural calendar, the premiere of Kurt Weill’s Street Scene (February 2018). There will also be his long-awaited return to Puerto Rico, where the singer grew up, in a concert within the Casals Festival programme which will mark a very special moment for him and in which he will perform Mozart’s Requiem (March 2018); in April he will go back to the Teatro Municipal in Santiago de Chile, this time to take the role of Don Ottavio in Mozart’s Don Giovanni. Copyright Joel Prieto 2012. Website by Lenny’s Studio.